Chris Smalling (knee injury), Phil Jones (toe injury), Juan Mata (groin surgery), Wayne Rooney (ankle injury) and Ashley Young ruled out. Jan Kirchhoff (cartilage knee injury), Duncan Watmore (ACL knee injury), Paddy McNair (ACL knee injury), Adnan Januzaj (not eligible) and John O'Shea (personal reasons) ruled out. Steven Pienaar (calf strain) doubtful. Sunderland Association Football Club (nicknamed The Black Cats), are a professional football club based in Sunderland, Tyne and Wear, England - and were founded in 1879 as Sunderland and District Teachers Association Football Club by James Allan. Although they haven't been competitive in recent seasons, Sunderland were one of the most successful clubs in the nation through the late 19th century, and the early parts of the 20th, winning 6 league championships between 1892 and 1936, and were termed the 'Team of All Talents' at the turn of the 20th century, aside from winning the FA Cup twice and the League Cup once. 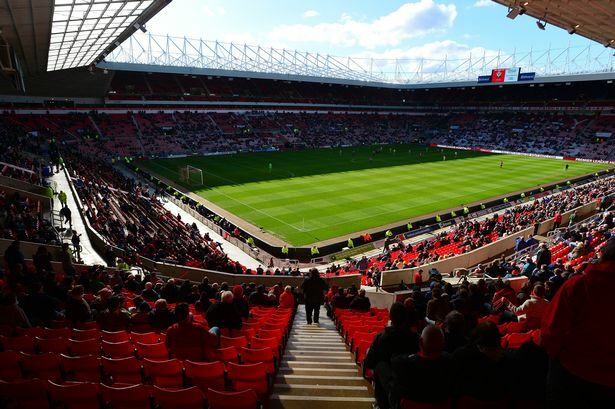 The club plays its home games at the Stadium of Light, and has a long-standing sporting rivalry with neighbors Newcastle United in a match termed the Tyne-Wear Derby. And so begins Sunderland's great escape. We have to try and make it difficult for Sunderland. It's away, I might be incredibly daring and predict a 1-0 win. Wouldn't bet on it though. 0-0 or 1-1. Hmmm. Tough decision. If we score early we will probably win like 3-0 or something. If we don't manage to score by the 20th minute we will draw. Fellaini to start up top. We're away so I think we'll win 2-0. If we can't beat that shower of shite then we may as well pack it in and go home until the summer. 1-1 written all over this. Moyesey will be up for this one. 1:1. If only we could vent all of our anger on that clown and win convincingly 2:0. Away game against the bottom side, we might actually have a chance of winning this one. After the last two games I think Mou should decide who he needs for the EL game and rest as many as possible, if only to protect against injury. Fourth is just not on now. It will be hugely symbolic if we end up struggling to a draw or a loss against Moyesy. Then again he might get a slap even though he's our former manager. We win this one easy. 3-1 United. 0-3 you bunch of fannies. It's feckin Moyes Boys. We have to win this to have any chance at top 4. If we lose all eggs must go into Europa basket. Not really sure what changes Jose might make for this and I think top 4 has gone anyway. This is the easiest of our 3 games. Let them have the ball and have a go at us. Moyes wont know whether to attack or park the bus, he will sit on the fence. We will take the ball off them, attack the space and score. Annoyingly so to speak, we will still be in contention to finish in the top 4 because I expect Chelsea to beat City, and I reckon Liverpool will go on a bit of a bumpy end to the season, and Arsenal are on the ropes. De Gea has made 2 quite glaring mistakes in past 2 games. Saved by the bar on Saturday and cost us points today. Not sure whats going on with him, maybe bench him to give Romero some match fitness before 1/4 final? 9% voted for a Sunderland 5-0 win? After that shambles of the past four days all the eggs are already there. It'll take a miracle for us to finish in the top four. who cares. rest players and bring on the Europa.